Home / Bench Notes / Bone Nuts: The best upgrade ever? If I were to tell you that one simple upgrade to your guitar can improve the tone, response, character, and tuning stability of your guitar, your response would probably be “Of course I want one!” Cynics might be more apt to say “Yeah, right, pal.” It doesn’t take much time playing a guitar with a bone nut to realize what a difference it can make. Bone has several characteristics that make it a great choice for nuts and saddles. The most important are its resonant properties, which closely match the frequencies that we hear most and those of the wood we use in the guitars. This results in a clearer and more transparent sound. 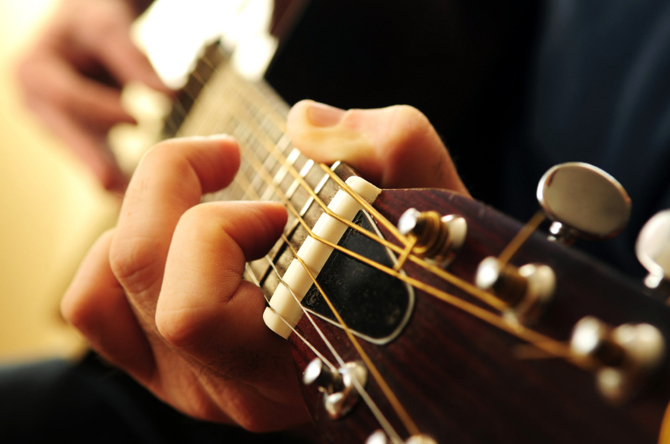 Many of the plastics used in nuts have little resonance, so the nut dulls the tone of the guitar. The mass of the nut is also important. A nut with too much mass isn’t going to pass the string vibrations into the neck as efficiently, so you’re going to hear less of the wood and natural properties of the guitar. This is why brass nuts became popular in the 70s. With all that mass there was more sustain, but it detracts from the character of the guitar. With a bone nut, you get a perfect balance of resonance and mass, which results in clarity and tone you just can’t get with other materials. It’s an affordable upgrade that can make a world of difference.